To open the full policy brief click here. 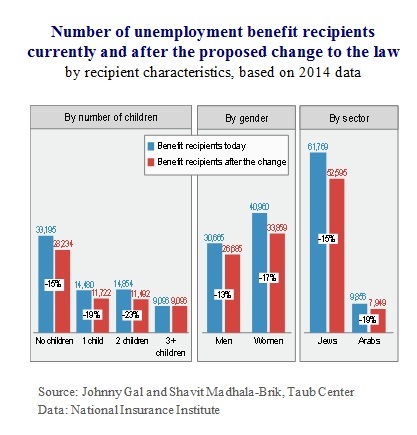 A new study by the Taub Center for Social Policy Studies in Israel looks at the implications of the proposed change to the unemployment law and compares unemployment benefits in Israel to other welfare states. The research shows that implementing the change will deepen the disparity between older unemployed individuals and younger ones, who already have fewer rights. In addition, the change in the law will bring about a substantial reduction in the number of young unemployment benefit recipients and will primarily harm women, families with children and Arab Israelis. Between the years 2000 and 2014, the share of young adults (under age 30) among those receiving unemployment benefits went down by nearly half, and today stands at only 16%. The eligibility period for receipt of unemployment benefits in Israel today (prior to the change in the law) is at least 12 months of employment out of the 18 months prior to unemployment – a policy that is similar to most European countries. After the proposed change, the policy in Israel is likely to be much stricter relative to other European countries primarily for the young unemployed. In 2007, the amount of unemployment benefits paid to young adults (under age 28) was reduced. Thus, the level of benefits available to young adults is lower to begin with, irrespective of their salary level. Due to differences between younger and older adults regarding the duration of unemployment benefits, according to the current law unemployed individuals over the age of 35 are entitled to 3.5 times more days of unemployment benefits than are individuals under the age of 25. The proposed change will lead to a savings of NIS 78 million in social welfare expenditures, but will substantially decrease accessibility to unemployment benefits for the young unemployed. It will primarily negatively impact women (about 64% of all of those affected) and unemployed individuals with families (23% of those previously receiving benefits will no longer be eligible). The subject of unemployment benefits is currently high on the public agenda following proposed changes to the unemployment benefits law. According to the proposal, the eligibility period required in order to receive benefits (which is currently 12 months of employment out of the 18 months prior to unemployment) will be lengthened to 24 out of the preceding 30 months for those under the age of 30 and 18 out of the 24 months prior to unemployment for those between the ages of 30 and 35. A new policy brief by Taub Center Principal Researcher Prof. John Gal and Researcher Shavit Madhala-Brik discuss the law and the implications of the proposed changes for young adults, examining them relative to the provisions in the law related to older unemployed individuals as well as to what is common in other welfare states. The findings show that the proposed changes would make the eligibility requirements for unemployment benefits for young Israelis particularly strict compared to the requirements in other welfare states. The share of young unemployed individuals among all those receiving unemployment benefits is relatively small in Israel. Between 2000 and 2014, the share of unemployment recipients under the age of 30 trended down, and it currently stands at 16% of total unemployment benefits recipients. In contrast, the share of the unemployed between the ages of 30 and 34 in the same years shows no substantial change. Taub Center researchers Gal and Madhala-Brik point out that the majority of unemployment recipients between the ages of 25 and 29 are women and a third have an academic education. Among unemployment recipients between the ages of 30 and 34, the share of those with an academic education is higher and stands at about 40% of the unemployed in this age group. Over the course of 2013, 289,000 individuals registered with the employment services, with about 85% placing a claim for unemployment benefits. Out of the remaining 15% who registered but did not place a claim, about 60% were under the age of 34. According to the Taub Center researchers, there are several reasons why a claim might not be submitted, including that the eligibility requirements regarding prior employment have not been met. There are existing differences in the law with regard to the entitlement period for younger and older unemployed individuals. Those over the age of 35 can receive benefits for a period between 138 and 175 days while those under the age of 25 can receive benefits for 50 days and those between the ages of 25 and 28 are entitled to 67 days of benefits. Thus, an individual over age 35 is entitled to 3.5 times more days of unemployment benefits than someone under the age of 25 (see figure). The employment eligibility requirement, that is, the number of months of employment out of the qualifying period, is a central feature of unemployment insurance. As stated, the current requirement is 12 months of employment out of the 18 months prior to unemployment. This is a similar policy to what is common in many European countries.Until 2007, the level of unemployment benefits was the same for everyone, regardless of age. In that year, in the framework of the Economic Arrangements Law, benefits were reduced by 25% for those under the age of 28. Thus, the level of the unemployment benefit paid to young adults is already relatively low, regardless of their wage level (which is also on average low). The average daily benefit level among unemployment recipients age 24 and under is NIS 113, the average for those between ages 25 and 29 is NIS 149, while the average for all age groups is NIS 182. There are countries, however, where the conditions are less rigid. In Iceland, for example, only 3 months of employment out of the preceding 12 months are required. In Hungary, while 12 months are required, they can be accumulated over a period of three years preceding unemployment. As can be seen in the table, the ratio between the number of months of employment required and the qualifying period is high relative to other welfare states – meaning that the conditions to receive unemployment in Israel are more rigorous. As stated, the proposed change in the law includes lengthening the employment eligibility period for younger individuals. 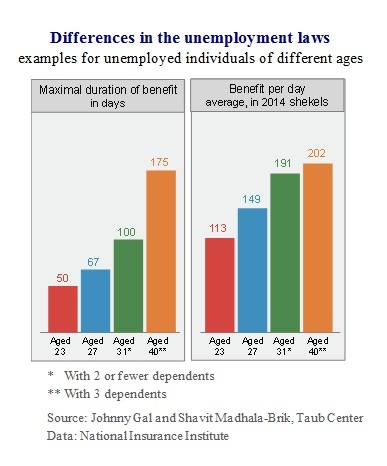 The Taub Center study by Gal and Madhala-Brik shows that this change will raise the ratio between required months of employment and the qualifying period to 75% for unemployed individuals in the 30-35-year-old age group and to 80% for the under 30s – figures that are exceptional among welfare states and indicate a unique level of stringency for receipt of unemployment benefit requirements for young adults in Israel. Since first legislated, unemployment laws in Israel have undergone many changes. One that was adopted in 2007 related to the eligibility period for discharged soldiers. Previously, discharged soldiers were exempt from an eligibility period, but the change in the law set entitlement requirements for them, as well: a period of 6 months of employment out of the 12 months following discharge from the army. In practice, the number of discharged soldiers who received unemployment benefits in 2014 was particularly low and stood at 1,796 (relative to 29,901 in 2006). The proposed change to the law will mean that about 15% of those receiving benefits today (about 11,000 unemployed individuals) will not be entitled to benefits. According to Gal and Madhala-Brik, this impacts individuals whose average unemployment benefit level is lower than average. The figure presents the distribution of unemployed individuals who will lose their benefits following the change to the law and shows that the majority of those harmed will be women: about 7,100 women (about 64% of the total group) will no longer be eligible for unemployment benefits versus about 4,000 men (about 36%). Another group that will be seriously harmed is those with one or two children: about 23% of parents with two children previously receiving benefits will no longer be eligible for unemployment benefits after the change to the law.